J​oin us Sunday for worship at 8:30am or 11am. Sunday School will be at 9:45am. Thank you for visiting our website! We hope you will join us for worship on Sunday at 8:30am or 11am. We also have Sunday School at 9:45am. We have a small, diverse church that loves the Lord and desires to share the Good News. Check out the rest of the website and if you have any questions, we would be happy to answer them! God Bless! *Summer worship will begin May 12th. 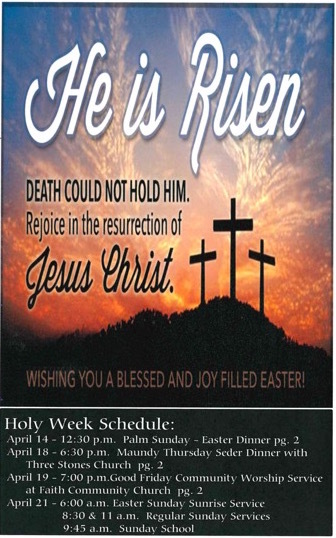 Sunday school will be at 9:15am and the worship service will begin at 10:30am. Go to our events page for more info!